Elevate your adventures in The City That Never Sleeps at Renaissance New York Times Square Hotel. Rising 26 stories above Times Square, our hotel has the soul of a boutique hotel with beautifully crafted interiors. Distinct among Times Square hotels in New York, Renaissance boasts stylish guest rooms, including new guest rooms with terraces overlooking Times Square. Be sure to enjoy a cocktail in the newly renovated R Lounge, boasting panoramic views of Times Square before venturing out to Rockefeller Center or the famous Theater District. Only steps away from Midtown's famed entertainment, attractions and Fortune 500 headquarters, our hotel provides space for memorable private events. Our boutique hotel in New York City boasts a prime location on Broadway. 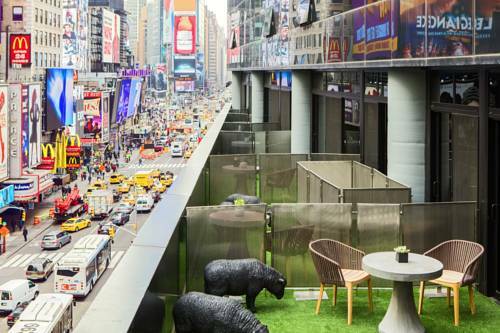 Renaissance New York Times Square Hotel is the epitome of an urban oasis book your stay today! Discover stunning view of Times Square at the newly renovated R Lounge. Club Lounge members can start their day with a delicious buffet in this private dining area. At night, R Lounge offers flavors of Manhattan, brought to you by expert mixologists. - N,R lines for MTA - 49th St.